Take The Twilight Zone, mix it with The Complete Brothers Grimm, set most of it in feudal Japan, and you can get a pretty good idea of what this book was like. A series of collected Japanese short stories, strange events, and local legends, gathered meticulously in the mid-1800’s through early 1900’s by writer, journalist, translater, and scholar, Lafcadio Hearn, this book among other works by the same author were the most influential forces in bringing Japanese culture to the West. Because of this book, the people of Japan became just that; people. No longer were they a mysterious culture from a far-off land, but wives and monks, soldiers and farmers, children and elders. They fought for land, wept for lost loves, and squabbled at the market. Most notably, an aspect that changed their standing in the western eye was fear. Fear is something that all people know. All children at some point are afraid of the dark, all men hesitate to walk in the woods at night, and warriors contemplate it as they draw their last breaths. It is what makes you drawn to the firelight as the darkness surrounds you, and look over your shoulder in the noonday sun. Cultures differ, but East and West will always know fear. 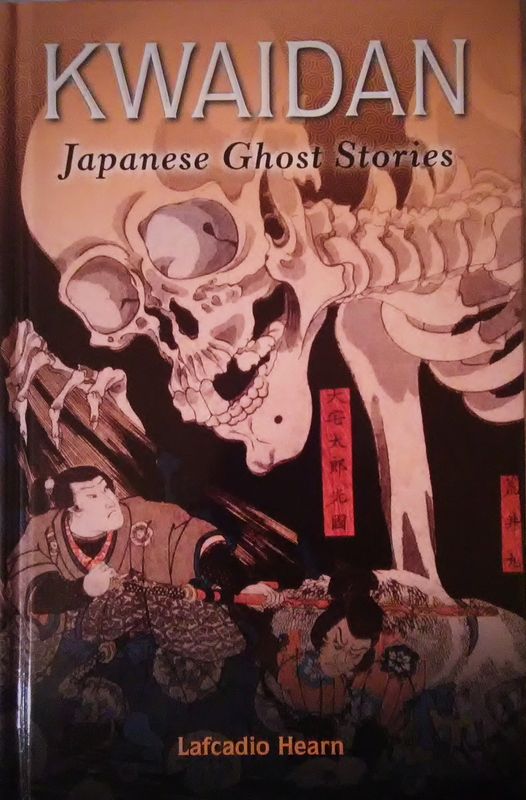 This edition from 2010 was beautifully illustrated with period-correct (and quite chilling) works of classic Japanese art.The title translates loosely to the phrase ‘strange talk’ or ‘strange stories’, and has been an actual separate genre of Japanese literature for as long as written language has been employed there (at least according to the Internet 😊). The stories themselves aren’t always incredibly frightening, although many feature spirits, man-eating goblins, restless ghosts, warrior monks, demons, snow women, and other paranormal people and creatures. The overall feel of the book combined with the stunning–and bone chilling–artwork creates a disturbing but fun (and even occasionally comedic) atmosphere for the reader, of the sort that makes one hide beneath the covers at night but question why. The author clearly had a deep love for the country he (for a time) called his home. Reading the stories he documented that were passed through the generations, as well as his own impressions, really gave a sense of perspective into life in ancient and turn-of-the-century Japan. For instance, he describes the shrines and cemetery behind the decrepit temple near his house, and how the mosquitoes are drawn to the temple as a result of the cups of water left at the memorial shrines. The monks couldn’t do anything about them, as to kill anything, even a mosquito, would be comprimising their beliefs, so the insects reigned supreme. His vivid description of Old Tokyo was particularly interesting; when we think of Tokyo, we think of the thriving, somewhat polluted, and bustling metropolis of light and sound that we know today, but over a century ago, Hearn described a world of pure air, waterfalls, the chimes of ceremonial gongs, and paths carved by footsteps and carts, not cars or buses. Hearn’s footnotes are detailed and plentiful, but he was careful not to go off-topic or make them too long. They in no way break up the flow of the stories; if anything, they augment them wonderfully, and add a level of depth and insight that one would otherwise surely miss. In addition to his personal anecdotes, my impression is that he tried to stay as close to the original stories shared in his interviews as possible, with the exception of a little dialogue for human interest. In addition to the stories, there are also three essays by the author tucked in the back that themselves contain interesting cultural information on certain motifs typical to the Kwaidan genre that were employed in the book, as well as classical hiakus and a few extra stories and myths. The first is on butterflies and their connection to death and the Underworld in mythology, the second on mosquitoes for similar reasons, and the third on ants. The ant essay, however, gets a little weird. He goes on to ponder the steps necessary to achieve this ‘utopia’ in our own human world, and actually lauds the idea of forced-sterilization in order to create a super-human without any sense of self. This is obviously pretty kooky and a terrible road for the author to walk down, but I feel it was written, in its own way, with a twisted innocence. This is the nineteenth century (at least at the time Hearn was living in Japan): Charles Darwin had taken public his scientifically game-changing Theory of Evolution relatively recently. This prompted a look into the ethics of selective breeding in mankind: If Man truely was created as a result of a series of natural changes over an extended period of time, then it follows that theoretically, he could be made to change even further. To many of the educated or at least well-read classes, eugenics was a new and brilliant concept; people saw it as a cure for all diseases, a way to create Gods among men, and for every critic, there was someone who considered it a light at the end of a tunnel society wasn’t even sure existed anymore. Because no one had ever before considered that perhaps Man hadn’t always been the top predator, society had no way of handling such a humbling concept as the idea that the we could ever have descended from such lowly mammals as apes. As a result, instead of integrating the evolutionary theory into our beliefs and religions (or at least recognizing it as a valid one) as most people have now, there was a tear within the scientific and philosophical communities: There were those who mantained that Man was created by God, and thus subject to a stiff code of morals, and those that mantained that Man was God. This was as dangerous as it was popular, because if man was God, then it was only natural for Him to have complete power over Humanity as a whole. Morals and ethics were irrelevant if it suited what God (man) deemed right for the ‘common good’. In this line of thought, Heaven was control of Nature, therefore, Hell must have been uncertainty of it. To seize control was to fight this Hell, and so, logically, an act fundamentally good. We now know from our mistakes that there is a line between science and power that must not be crossed, and that, as it is a fact that Faith can easily walk hand-in-hand with science, so, too, can atheism with morals and an ethical code. However, the world was in its own way quite innocent back then; we had no way of knowing of the tyrrany that can come from toying with eugenics, even with the purest of intentions. The horrors and cold acts of genecide from the coming World Wars were not yet even an idea, so the scientists and philosophers of the time would likely never have known for themselves what the consequences their idle dreams of a selectively-bred utopia would be, until humanity saw them in action curtesy of the Third Riche during World War II. I can’t stand up for the concept of eugenics, but given the context surrounding the time period, I understand why the author would have come to some of the flawed conclusions that he did. Now, weird eugenics chapter aside, this was a great read, as educational (it’s not a bad word, people!!) as it was fun and scary. I give it a 4.5/5. PS. Be sure to read the introduction and author’s note!! It isn’t just fluff; it gives context and a fascinating background to the author’s personal history, as well as what was going on politically at the time. Age group: teen to adult, maybe fourteen at the youngest, not necessarily for the scary factor (although it’s sometimes pretty scary) but for adult situations such as murders, women being promised to men for sexual servitude (this is feudal Japan, remember), violence, and other adult concepts and situations that (despite being written delicately and tastefully) a kid might not have the tools to comprehend maturely. There are also a few detailed explanations of how certain Old Magic as well as normal Buddhist rites are done, so while educational, it is a little deep as a concept for a kid to learn about. That and the ant thing–that was just weird. Read it first and decide for yourself. What do YOU think? Have you ever read Kwaidan, and if so, thumbs up, or down? What was the last book you read? Previous What the What? #10: Fudging ridiculous. Last book read (re-read) was Shibumi by Trevanian. Haven’t read Kwaidan but I’ve heard of him. I will research to remind myself where.